Worried you’ll miss dancing over the summer? We’ve got you covered! Our summer programming helps keep dancers in shape and working on technique as well as new material throughout the summer. Registration for all summer programming will begin May 18, 2019. Beginner & Advanced Beginner dancers are strongly encouraged to participate in our summer workshop to be eligible to compete at fall feiseanna. We will have Grades classes over the summer for dancers interested in challenging a Grade between 1 through 6. Attendance is mandatory for any dancer interested in challenging grade exams in September. These classes will also be a great opportunity for dancers in our performance program to maintain their skills and progress over the summer. From July 8 – August 26, Monday evenings 5:30 – 6:30 pm. The fee is $157.50 per dancer. Rather than run a one-weekend workshop for dancers in our Belfast & Dublin classes, we will be starting their classes early, on August 1st. For the month of August, these dancers will jointly attend class from 6:30-8:30 in preparation for the coming year, and our Tyler Schwartz workshop. We are so excited to share with you that we have arranged for the incredibly talented, “Mr. 10 clicks” himself, Tyler Schwartz to come to Regina and do a workshop with our dancers! We are expecting 100% attendance from our competitive dancers at this workshop. The dates for the workshop will be September 13-15, 2019 so please mark your calendars! Dancers for whom this is applicable will receive an email once the schedule is set. **There won’t be regular classes this weekend, so dancers in our performance stream will have a rescheduled class at a later date. Another amazing weekend of dancing is under our belts. A huge thank you and shout out to our parents and dancers who enabled us to provide over 18 performances in one weekend, well done all!! We had wonderful feedback from our audience, our dancers truly know how to put on a show (or 18 as the case may be!). We instructors greatly enjoyed the weekend and appreciate how easy our dancers and parents made the whole weekend for us, thank you! A huge shoutout to Jenah for winning her second treble jig trophy and advancing to Preliminary Championships! That smile says everything! Well done, we are so proud of you!! A huge congratulations to Emily on winning two Treble Jig Trophies in one weekend, securing her place as our newest Preliminary Championship dancer!! Well danced my dear, we are proud of you! Looking to buy, or to sell, Irish Dance Shoes? We now have a new method of buying and selling your used dance shoes. Email shoes@prairiegaeldance.com with the size & type of shoes you have available to sell, or are looking to purchase. To try on a pair of shoes, email and arrange a time to go to the mini studio and test out the shoes! Visit prairiegaeldance.com/shoes for an up-to-date listing of the used shoes available. What a successful (pre) Oireachtas for Deirdra! Not even in preliminary championship yet and standing in the top spot on the podium, not once, but twice! Congratulations on winning your second treble jig trophy and graduating to preliminary championship, as well as winning the pre-Oireachtas Traditional Set Trophy - this qualifies you as our newest and youngest preliminary championship dancer!! What a busy first few weeks of classes we have had!! Two weeks in and we have already completed Grade Exams, and a Feis! Thank you to all our parents whose support and driving make lessons and other activities possible, us teachers and your dancers greatly appreciate it! Congratulations to our First Feisers: Grace N, Keira S, Isabelle L, and Ava H!! You ladies had a tremendous competition and we are VERY proud of you! Showing off some serious hardware, well done ladies! Congratulations to all our dancers challenging Grade Exams. Once again we had a 100% pass rate! Good job ladies!! 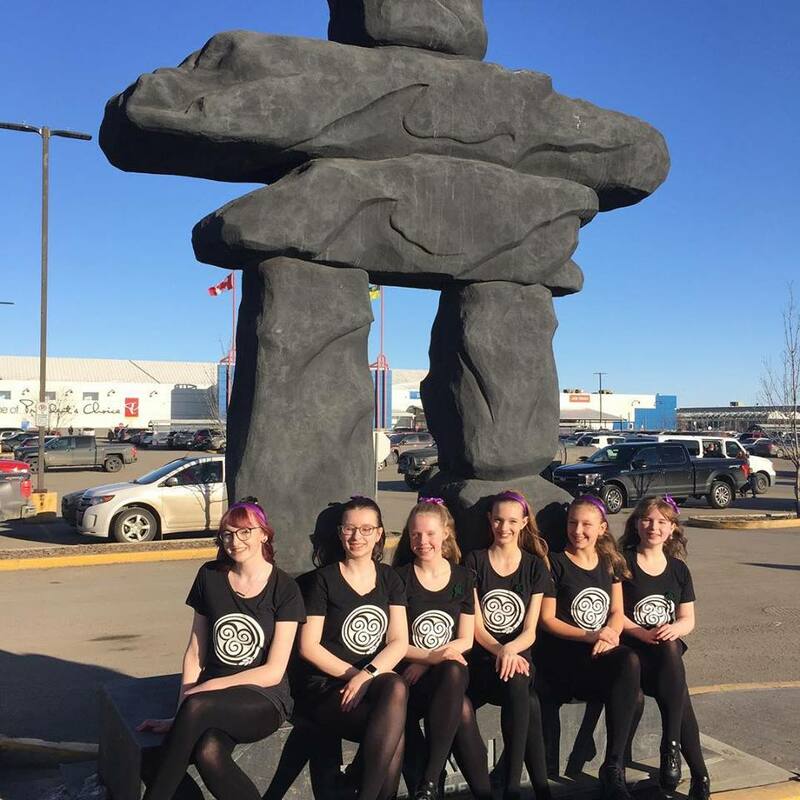 Multi-talented: Congratulations to Anneleise and Jenah on their fabulous musical talents! A special congratulations to Deirdra and Sam on winning their Treble Jig trophy’s!! Thanks so much to River City School of Irish Dance and their wonderful volunteers for another fabulous feis!! Some of our Prelim dancers showing off their hardware! We had a fabulous summer filled with classes and workshops to keep us fit and en pointe! Our regular grades classes kept our dancers in time as we learned new material and prepared for our grade exams at the River City Feis in September. Between our technique work, new material, yoga, and cross training, our summer workshops helped us keep our rhythm as we prepared for the fall feis season. Thanks to our special guests, Tara Popil and Kristin McKiel, for giving us an excellent workout! From medicine balls to training ladders to running laps in the alley, we had a HOT time learning new skills and strengthening our muscles! Year End Recital & BBQ! Our twentieth year ended with a bang! We had a fabulous recital at the Performing Arts Centre which showcased the hard work our dancers have put in all year long. We are grateful to Bushwakker for their sponsorship of our bar, and the donation of wonderful door prizes. We had a fabulous concession and are very thankful for our parent volunteers who helped out with the set up, sales, and tear down. We finished the weekend off with a fabulous bbq in Candy Cane Park. With over 100 attendees, including parents, siblings, and dancers, we had a fabulous gathering. We were lucky enough to avoid the rain, and had warm weather for a variety of games. Thank you ever so much to the fabulous dads who helped grill the hamburgers and hotdogs, and to the moms who brought a variety of games to challenge and keep us entertained - we loved learning 'poop the potato'! !